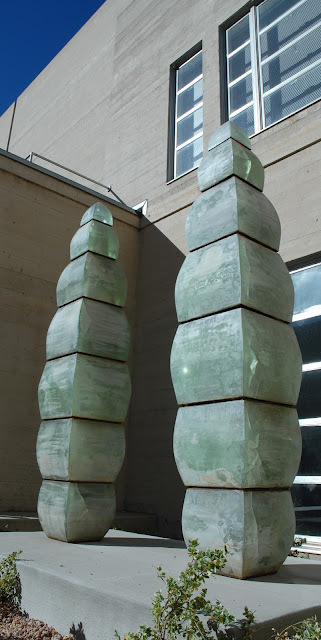 Fine Arts Center Blog: NEW Acquisition: Steven Durow's "Dasein"
The Fine Arts Center recently acquired a beautiful, new glass sculpture, Dasein, a gift to the FAC by artist Steven Durow, now on view in the our Courtyard. The title itself, Dasein, is a reference to German philosophy and generally translates to mean being, not as an object but rather as an awareness that influences the human entity’s understanding of the world and what it means to be. “Steven Durow’s Dasein will be a tremendous addition to the FAC’s permanent collection as it enhances the currently small holding of abstract contemporary sculpture which includes work by Bill Burgess and the new acquisition of Isamu Noguchi’s Mountains Forming,” said FAC Assistant Curator Joy Armstrong. Dasein also contributes to our Permanent Collection's glass works, of which the vast majority are by Dale Chihuly. This new acquisition expands challenges aesthetics and forms traditionally associated with glass. Durow considers glass to be his primary medium, but this emerging artist is also a skilled sculptor working in steel, wood, and stone as well as creating works on paper. He received a BFA from Anderson University and an MFA from Tulane University, specializing in glass and architectural scale sculpture and installation art. He is a Senior Professor of Practice at Tulane University and has taught glass internationally. He is an award-winning artist who has been reviewed and featured in publications such as Art in America, Sculpture Magazine, and Glass Quarterly. Additional funding for the installation of this piece is provided by the Debutante Ball Acquisition Fund.